This is one of those products that is absolutely built to do exactly what it does. The 13 x 13 Garden Party Canopy Gazebo in Green is meant to look good, work even better, and to be the perfect backdrop for a party. It's also meant to do all of that without totally blowing the budget, part of which could be used for all of the other stuff you need for an outdoor celebrations. 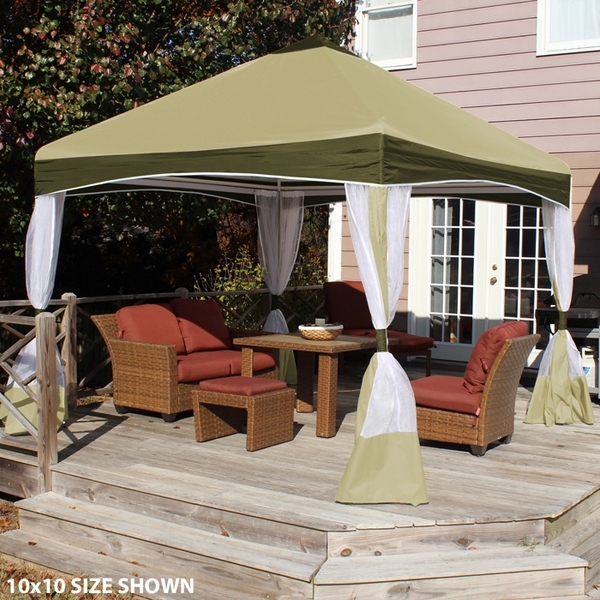 First of all, the fabric of this 13 x 13 canopy is made of 100% polyester that is 3M Scotchgarded to protect it for years of use. There is mosquito screening for all four sides, each of which has a middle zipper for entry and exit, and each of which has tie-backs for an attractive, casual presentation when not in use. The white powder-coated frame resists rust while providing great support, and assembly is incredibly easy for those impromptu parties. When you add in the fantastic look of such design features as the scalloped valance, you're looking at a shelter that brings a whole lot to an outdoor gathering. Getting people to have a good time outdoors isn't always that hard. It can be a little tougher, though, when the weather's not great, when bugs are swarming, or when the outdoor space in question doesn't look that appealing. 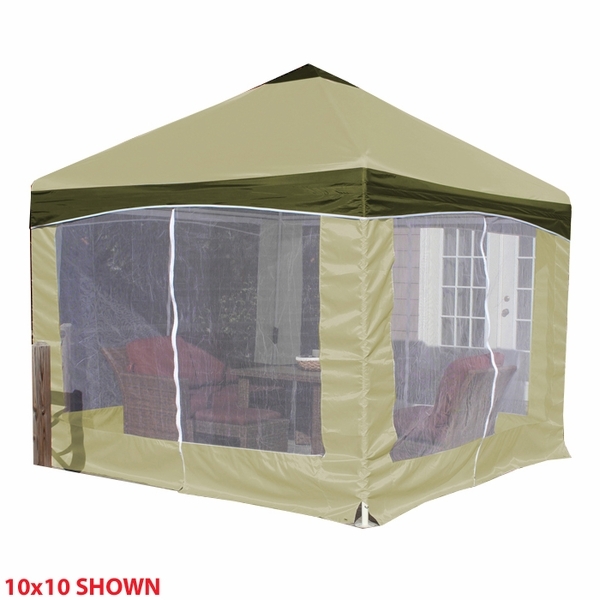 When one or all of these situations pops up, many people turn to the 13 x 13 Garden Party Canopy Gazebo. It provides all of the shelter, all of the comfort, and all of the affordability you look for in one convenient outdoor package. Is this canopy 13 x 13 pole to pole? The canopy is 13 X 13 pole to pole. Does this canopy come in 10x10? 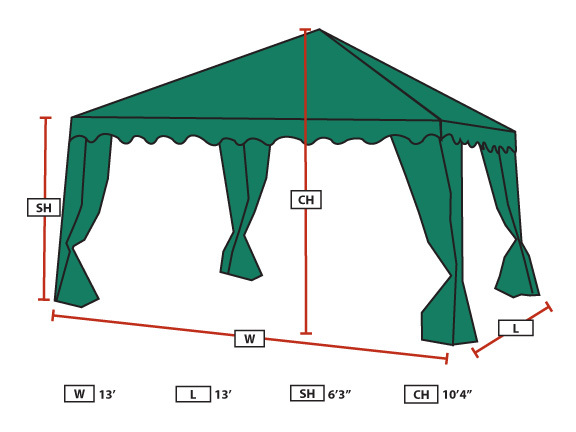 Yes, we do have the Garden Party Canopy in a 10 x 10 size. Will it handle a good strong rain without water entering from the roof panels? While the top material is highly water resistant, a heavy rain can cause some pooling. The water will need to be pushed off in order to prevent sagging or tearing of the material. Is there a replacement canopy cover to purchase for this party canopy that is 13 x 13? Can this be anchored to a concrete floor or does it have to be used on grass? This canopy can indeed be anchored to concrete. The foot pads on this model have holes in them, into which you can use masonry anchors (available at any local hardware store) to secure it to your concrete floor. I want to put this on my deck which is by a lake. Does it have vents on the peak to allow wind to blow through, so the wind doesn't rip it down? This canopy is designed for use as a temporary structure. 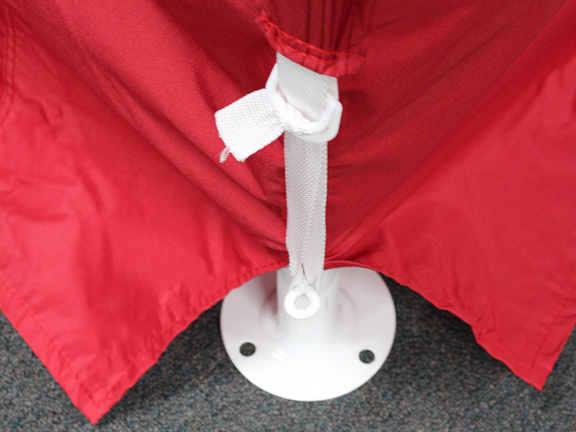 After assembly, the canopy must be securely anchored to the ground to prevent damage from winds. Your canopy will act like a kite in the wind if not properly and securely anchored to the ground. Severe winds will cause the frame to twist and unanchored legs will fall, thereby collapsing the canopy. If severe winds are expected, you must remove the cover from the frame to prevent damage.